Become Bulletproof today and join this amazing company in their efforts to help people perform better, think faster, and live better by using their products. You can advance your profits by joining Bulletproof’s affiliate program and sharing the gift of high performance with your followers and customers! Bulletproof has partnered with the Commission Junction to create an amazing and easy to set up program that is managed by Versa Marketing. Getting started has never been easier! Customers of Bulletproof rely on their pure supplements, foods and technologies, and can expect to feel a difference in how they perform the first time they experience them. These products include coffee & drinks, nutrition supplements, performance kits and amazing accessories. Bulletproof puts in a large effort to create environmentally conscious and ethically sourced products to build a sustainable foundation for future generations to thrive. Using a proven blend of ancient knowledge and brand new technologies, tempered by research, science, and measured results from their customers, top athletes and medical professionals they are delivering a wide range of state of the art products. Bulletproof’s most popular and high-demand product is their coveted Bulletproof Coffee. It has been raved about by famous actors, high performance athletes and medical experts. This special blend of products creates a coffee drink that will power your busy day with energy and mental focus, and free yourself from food cravings. To make Bulletproof coffee you start with 8 ounces of their freshly brewed coffee, add 1 tsp. of Brain Octane, along with 1 tbsp. of grass-fed unsalted butter or ghee. You then blend these ingredients for 20 seconds or until frothy and enjoy. 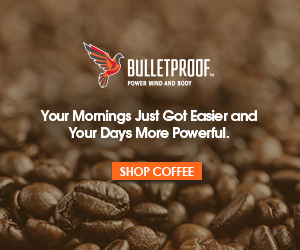 Bulletproof also offers alternatives if you don’t have the time to make the Bulletproof coffee or don’t like coffee. One of these alternatives is the instamix which is a packet of instant Bulletproof coffee. Inside the packet are the grass-fed butter and Brain Octane combined into a powder that you can mix into your coffee instantly, eliminating the need for a blender. A unique aspect of Bulletproof coffee is that you can make the high performance drink with green tea if you don’t like coffee! Another delicious and energizing drink Bulletproof offers is a special blend of Hot Chocolate and Cacao tea that offer great benefits to your body as well. Quality fats, proteins, supplements and quality snacks are also offered by Bulletproof and recommended to maintain the Bulletproof lifestyle that can help you lose weight, gain energy, upgrade your brain, hack your food cravings or just feel great all the time. Some of these nutritional products include Brain Octane, which is a key ingredient in the Bulletproof coffee, Collagen Protein, Chocolate Fuel Bars, and the Aging Formula supplement. Bulletproof offers performance kits as well, which allow you to purchase a variety of products in one box. The boxes are organized by ambassador recommendations. Some Bulletproof ambassadors include Rachele Brooke Smith, Amanda Allen, Juliet Starrett and Dave Driskell. Bulletproof offers amazing accessories which include new and cutting edge technology, and a variety of cookbooks and diet books. Their tech products consist of products such as the whole body vibration plate used to improve mind and body through good vibrations and the Zen Tech iPhone or iPad blue-blocking screen protector. The Bulletproof diet book is a New York Times Bestseller! Written by the CEO of Bulletproof, Dave Asprey explains the best way to avoid toxins, upgrade your health, harness abundant energy, support weight management and fuel your brain and body with the right foods. This diet plan ditches the traditional “diet thinking” and implements a lifestyle where you skip breakfast, stop counting calories, eat high levels of healthy saturated fat, work out and sleep less while also adding smart supplements. The Bulletproof affiliate program allows for your website to link to exclusive products that are extremely popular and loved by thousands of people. It is a chance to share high-quality products that help supercharge your body and upgrade your brain. If you have an audience that is passionate about health and wellness and upgrading their performance then the Bulletproof products are a perfect fit for them. Bulletproof also has a monthly contest giveaway for their affiliates. It is a chance to earn more cash, prizes and exclusive giveaways. Multiple benefits come with joining the Bulletproof affiliate program. These include a 45 cookie life, co-branded landing pages, top-industry commission, and remarkable affiliate support. In the Commission Junction affiliate publishers earn 10% on all sales generated through Bulletproof.com. Visit CJ.com or Bulletproof.com to sign up for the affiliate program today!